ROMANCE BOOK PARADISE: Judy Croome and "Dancing in the Shadows of Love" Giveaway! Judy Croome and "Dancing in the Shadows of Love" Giveaway! 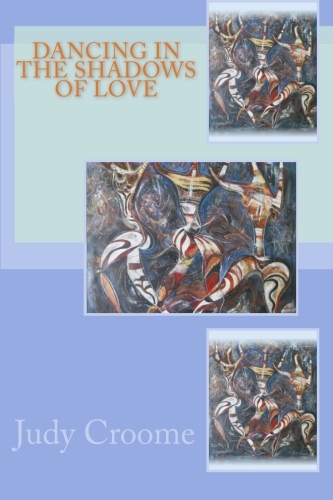 Today we have South African author Judy Croome visiting and she has copies of her novel, DANCING IN THE SHADOWS OF LOVE to giveaway to three lucky commenters! Judy Croome lives and writes in Johannesburg, South Africa. Her short stories ‘Born Beneath a Balsamic Moon’ and ‘Heroes Day’ have been published in ITCH magazine. Other short fiction and poetry appeared in “Notes from Underground Anthology.” She was recently shortlisted in the African Writing Flash Fiction 2011 competition. Regency England. My choice is probably influenced by my love of Georgette Heyer and Jane Austen romances, but the easy grace of life in those times strongly draws me. The reality of the era (especially if you weren’t an aristocrat) was probably grim, but those times strike me as being perfectly balanced on the cusp between a mellow, bucolic existence and an exciting period of social transformation. There was time to enjoy the beautiful and gracious things in life, and yet the promise of technology was already beginning to ease the physical hardships of life. Do you draft your stories in longhand or on computer? First draft is always in longhand, in pencil. Then I transfer it onto computer and do all my edits on computer. If I try to write the first draft on the computer I get too easily distracted by the temptations of the internet and email and, more importantly, when I write in longhand, I feel closer to the words I write. What single thing would you do to improve the quality of your life? I’d lose weight. I went on my first diet when I was fourteen, and developed an eating disorder in my mid-thirties. I’ve finally accepted I’ll never have a svelte body like Kate Moss, but I can be a healthier weight than I am now. Since I’ve gained so much weight I’m not as energetic as I used to be and I can’t do as much in each day (I used to only sleep 4 or 5 hours a night; now I puff and pant my way through the day and need at least 8 hours sleep) So, yes, losing weight would dramatically improve the quality of my life on both an emotional and physical level. That’s a long story! When I started writing it I called it “Albino Blues,” but the supervisor for my Master’s degree didn’t like that title. After some serious brainstorming, we finally agreed on the title “And the Sea Looked.” I liked that title because the sea/ocean is one of the major symbols in the book, meant to represent a neutral, non-judgmental and ever-present Divine Presence that watches over our lives. I was attached to “And the Sea Looked,” so I had quite a struggle finding a new title before realisation hit me. I’d always known the painting that I wanted to use for the cover was “Man & the World of Stars” by Wenkidu and, one day I looked at it and realised what my new title should be: the painting shows three women dancing as they reach up to the Divine Presence in the sky above them. And my final title was born: “Dancing in the Shadows of Love.” Third time is the lucky charm! Where can we find out more about “Dancing in the Shadows of Love”? Judy, thanks for visiting us and sharing about Dancing in the Shadows of Love! Thanks for this fantastic giveaway, Judy, now where can readers find you? Readers can chat with me on Twitter and befriend me on Facebook. 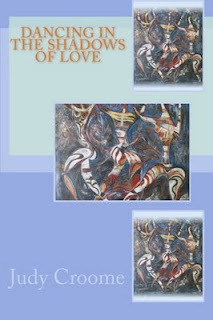 Judy Croome’s unusual novel “Dancing in the Shadows of Love” is available as both a print and eBook from Amazon.com, and as an eBook from Kobo, Barnes & Noble and Smashwords. I love the color, Judy. There's something very mystical about it, which I think is very fitting given the history of your title! I'm definitely interested in reading your work, especially after reading Jesse's review of it. And more power to you for writing longhand! I could never do it now that I have a computer. Best of luck, Judy, Nas! Thank you both for the awesome interview and giveaway! Judy, that is a great point you make in favor of writing in longhand--no social media distractions! Congratulations on your new book; I'm so glad you took time to guest post on Nas' blog today. Thanks so much for coming by. Dancing in the Shadows of Love is a wonderful tale. You would love it! I read somewhere that writing longhand stimulates the creative side of the brain. It's something I've always wished I could do. Congrats on your latest release, Judy! Sounds great. :) I couldn't imagine drafting in long hand. Your poor little hand! At the moment I have pain from the right shoulder through the hand and I can never imagine writing long hand, even typimg is difficult! Thanks to you all for coming along to read about Judy! I couldn't imagine writing anything longer than my name an address in longhand these days. Even when I did write I always loved the computer keyboard more than a pencil. Something about easily seeing your mistakes in black and white and being able to fix them just as quick. My hand hurts just thinking about writing a whole novel in longhand! Thanks for the interview and giveaway Nas & Judy! Nas, it's great to be here! Hope your right shoulder gets better soon! Michelle: Hemingway was a fan of writing longhand, and Louise Erdrich is a modern writer I know of who still prefers longhand for the first draft. It's not for everyone, but works for me :) And I'm glad I could visit! Lacey, I can well believe that - my writing is definitely different when I write longhand vs computer. Lydia K: Nice to meet you too...and your hand muscles (?) soon get used to it! Lolarific: Strangely, I started writing longhand to avoid the internet distractions and ended up preferring it. I think if you can discipline yourself to stay off the 'net when writing (which I can't!) then computer writing is a lot easier. The internet has a lot to answer for with all its distractions, but I'm not sure I could write longhand. Good luck with Dancing in the Shadows of Love. Great interview, ladies! And wow, first draft in longhand? I'm impressed! Lovely to meet you, Judy! I am amazed at the number of authors who write their first drafts in longhand; however, I can see the attraction of writing away from anything electronic. Far fewer distractions! Dancing in the Shadows sounds absolutely scrumptious. And I am totally with you on the weight thing. I was a skinny minnie with energy to spare until my thirties. Then I started having children and packing on the pounds. Recently I took a blood test, found out I was severely depleted in a whole host of vitamins. Doc prescribed some powerful vitamins to build me back up and my food cravings have practically disappeared. 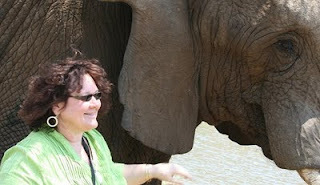 Judy, I love your picture with an elephant. That is very cool! I'll check out your book. Nice to meet you. Great interview Nas! Drafting longhand would kill me, but I understand not wanting to be distracted by the 'net etc. Nice to meet an author from so far away and in such an exotic location too! Gonna go over and check out the book blog. Wishing you success with the book. Nas, good questions that allowed me to learn a thing or three about Judy. It was really heart-warming to read how the story title came to be..and "Dancing in the shadows of love" sounds like an awesome book! REGINA: That’s so true! OnceI was put on chromium and magnesium my cravings were drastically reduced. Was such a relief to know that there was a physical reason! Now I just have to *lose* the weight I piled on (although it’s provided quite good padding against the awfully cold winter we’ve had this year!) Hope you’re back to being a skinny minnie! KERRI: That day with the elephants was such a great day in the Pilansberg Game Reserve – the elephants we hugged were all orphans from Zimbabwe who had been saved from poachers and brought down to a safe haven in South Africa. They were really gentle giants! JL: South Africa, as beautiful as she is, is just home to me…and every time I visit Nas’s blog I’m filled with yearning for the exotic beauty of Fiji (friends of ours have just spent 2 years living in Fiji and loved it!) Thanks for the good wishes and your comment on the Dancing in the Shadows of Love blog. Isn’t the artist Wenkidu a fascinating man?!? JU: That title gave me such headaches! But it was worth it because it’s just perfect for the book and the cover art. Nice to”meet” you too! Hi Judy, I can see you're having fun time chatting with all my friends! Thank you all my lovely friends for coming along and keeping Judy company! What a great story, Judy! I love the new title. I think it's cool how you looked at your story with a fresh perspective, and sometimes changing a title can do just that! PK Lovely to meet you too! Nas, when things have settled a bit I hope to visit with you & your fabulous friends more often! There's a lovely vibe on this blog - so welcoming and lively! I also love drafting in longhand, although I haven't done it in almost a year. I really have to start something new soon. Nice post. Writing a first draft in longhand seems like a good idea, for the reasons you mention. I used to write short stories on thin (blue) paper that I got from someone whose father worked at an office supply store. It worked brilliantly. Misha, I've done short stories and poems in the past year or so, but I also really need to start the new novel that is hammering away at the inside of my head. And when I start it'll be in longhand with my trusty HB pencils! Very interesting cover. I love the color too! Theresa, if you find the cover interesting when you have time pop over and read the interview with the cover artist Wenkidu which adds such depth and meaning to the cover! The story sounds so interesting. I love the cover. What's it like living in South Africa? I've never been and haven't had the opportunity to talk to anyone who has. Hi Judy. Hi Nas. I was intrigued that you write your first draft in longhand. Wow. I totally agree that you feel more connected to your writing that way but I made a point of training myself to write on the computer. Judy, I love the story of how the title was born!I am an expat from Port Elizabeth who lived in Johannesburg before moving to Australia in the '90's. It was great to share your experience. Good Luck. Lovely blog as always, Nas. I enjoy visiting your site. I'll be contacting you shortly to arrange delivery of your book. The hand connects the heart and the brain to the page. Therefore longhand is the best way to write. Congratulations to Juanita, PK Hrezo and Lolarific! Thank you to all my lovely friends for coming by and thanks to Judy for taking the time out and to be with us!